We’ve always got our ears to the ground when it comes to finding the best supplements on sale right now, and so we were keen to learn more about Ripped Freak. It’s marketed as a “hybrid” supplement designed to help you reach your goals more quickly. The label says that it will help to support “healthy” results while also helping in other areas as well. But does this product live up to the marketing hype and deliver on its promises? Let’s take a detailed look at it to find out. What does Ripped Freak do? You’ve probably already gathered that Ripped Freak fits into the broader range of supplements that have been formulated to help support you on your journey. These are products which have been formulated to help give you a boost when combined with the correct diet and exercise plan. 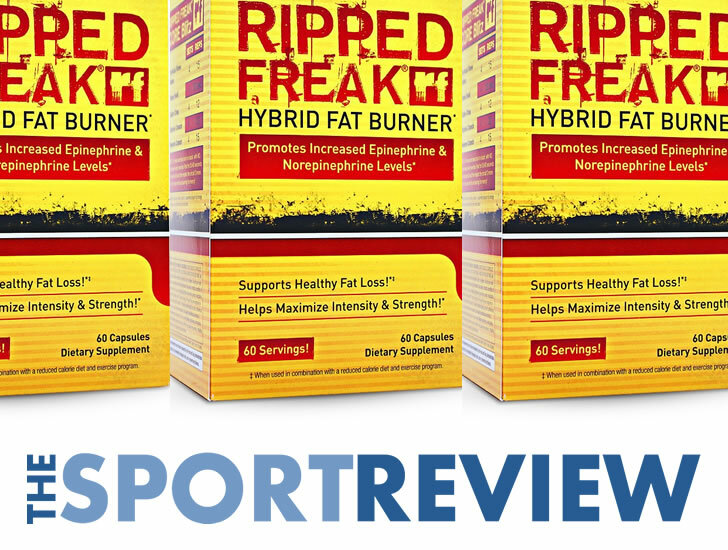 Ripped Freak contains a selection of ingredients designed to help support your goals. So, let’s now take a close look at the ingredients to see if this is a supplement you should consider taking or not. 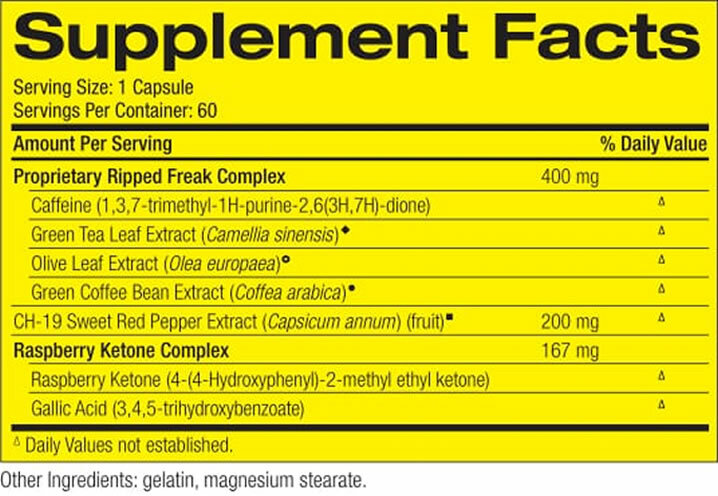 Let’s kick this part off by taking a look at the full ingredients label of Ripped Freak. As you can see for yourself, Ripped Freak uses seven different ingredients to help support you on your journey. The first thing we were not so happy about though was the fact that this product uses a proprietary blend called the “Ripped Freak Complex”. We don’t like proprietary blends because it means that the individual doses of the ingredients have been hidden in an overall ‘blend’. This makes it very difficult to judge the effectiveness of the product. Generally speaking, we recommend staying away from supplements that use proprietary blends. • Caffeine – A solid first ingredient. Caffeine is one of the most popular ingredients for a supplement like this, and you’ll find it in most of the top products in this category. It’s a good start for Ripped Freak. • Green Tea Extract – Another great ingredient. We always like to see Green Tea included in supplements like this. It’s a very popular hot drink and is often also sold as a supplement in extract form as well these days. • Green Coffee Bean Extract – A top ingredient. It’s high in a substance called Chlorogenic Acid, and you will often find Green Coffee Bean in the top products in this category. • Sweet Red Pepper Extract – This is basically the same as Cayenne Pepper. Cayenne is one of our favorite ingredients for a product like this, and you’ve probably come across it before. This is part of the proprietary blend but we’re told the dose – 200mg per serving. • Raspberry Ketones – This is a relatively common inclusion. It is one of the main ingredients in our pick of the best fat metaboliser supplement for women. It’s not a bad inclusion in the Ripped Freak ingredients formula. Ripped Freak certainly does contain some decent ingredients, even if the doses are hidden in an annoying proprietary blend. However, there are also some important things missing in our opinion. Firstly, there was no Glucomannan, which is a shame. Glucomannan is a natural dietary fiber which comes from the root of the Konjac plant. It was a shame not to find it included on the label. It was also a shame not to find any Black Pepper Extract on the label. You will usually find some black pepper extract in the top supplements around. We recently updated our guide to the best five supplements on sale right now. Check it out by hitting the link below. The main thing to bear in mind when it comes to side effects from this type of supplement is stimulant content. Lots of these products tend to overdo it on the stimulants, and that can cause side effects such as the jitters. The problem with Ripped Freak is that because of the proprietary blend they use, we don’t even know how much Caffeine is included per serving. This is not good, and means that the content could end up being too much for some people. We always recommend that you do your own research into each of the individual ingredients in any supplement you’re planning on taking for the first time. We do also advise that you speak to your doctor before thinking about trying any new supplement for the first time. Each bottle of Ripped Freak contains 60 capsules. That means that one bottle will last you for a month if you stick to the recommended dose of two capsules per day. The directions say that you should take one capsule with a glass of water first thing in the morning on an empty stomach. Then, it says that adults can take an optional second dose of one capsule in the afternoon, around 30 minutes before a meal. We generally prefer supplements that require you to take them at least three times a day, because that means that your body is consistently being provided with the ingredients. We found a few reviews of Ripped Freak on Amazon. At the time of writing this article it had an average rating of 4.3 out of five stars. One customer said that it worked “amazingly” for them and that was because of the combination of a good diet and exercise. Someone else was less impressed however, and described it as an average supplement with under-dosed ingredients. Not in our opinion. Yes, Ripped Freak does use some pretty good ingredients, but the fact that they are hidden in a proprietary blend means that they are probably under-dosed. It’s also missing some of our favorite ingredients such as Glucomannan. We’ve recently updated our list of the best five supplements out there right now. Check it out by tapping the link below. We always say that it’s important that you first get your diet and training regime on point before thinking about taking any kind of food supplement. There’s no ‘magic pill’ when it comes to losing weight, so you’ll need to make sure that you’re training hard and eating right first. That being said, a quality supplement can help to support you on your journey when combined with regular exercise and a solid diet. That concludes our review of Ripped Freak. Overall, we think this is an OK product with good ingredients. However, it’s let down by the fact that the manufacturers have decided to use a proprietary blend. That means that we don’t know the doses of the individual ingredients and points to some of them being under-dosed. Remember to check out our guide to the best supplements in this category on the market by visiting the link below.